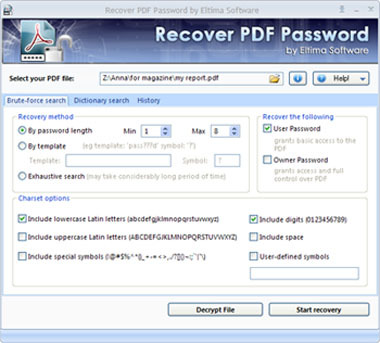 Recover PDF Password is a PDF password recovery tool by Eltima Software, which recovers passwords of PDF files if they were lost or forgotten. It can recover both user password, which prevents opening a PDF file and owner password, which protects information in PDF from being printed, copied or edited.The new version of Recover PDF Password is optimized to work on multi-score computers, which ensures higher speed password search. It supports all latest versions of Adobe Acrobat up to v.9 and can recover Unicode password. It will unlock protected PDF file whatever language or keyboard layout itspassword was created in. With this PDF password recovery tool you can use various methods of recovering lost passwords: by password length, by template or use exhaustive search method. Dictionary search, which is the most time-saving method. In such case Recover PDF Password will try different combinations of words variations and modifications before using more complex and time consuming brute-force search. If your PDF file is protected only with owner password you can use "Decrypt" option and createan unprotected copy of PDF file without password search. More than that, you can use Recover PDF Password to remove digital signature from your PDF files.